Everywhere we turn this past month, there is a report in a major newspaper about the declining Monarch butterfly population. 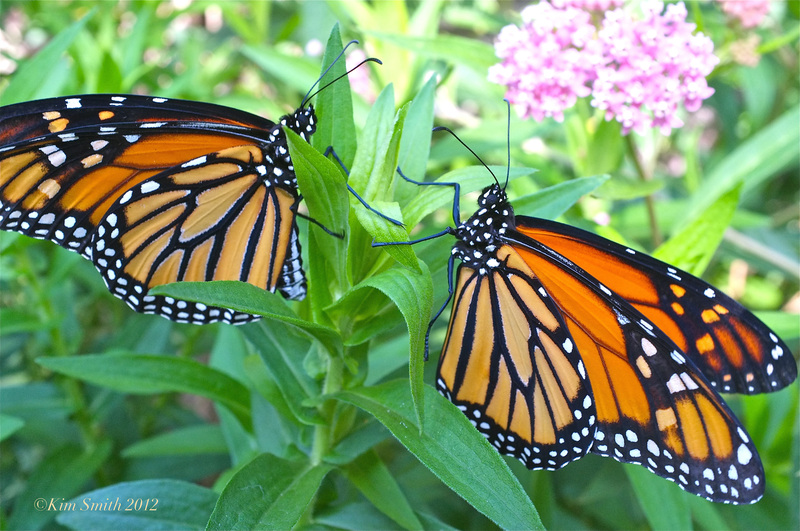 This forwarded from one of our readers: “Monarch butterflies keep disappearing. Here’s why” was published in the Washington Post on January 29th, 2014. The author, Brad Plumer, interviewed Dr. Lincoln Brower, a professor of biology at Sweet Briar College and one of the nation’s leading authorities on the subject. I will be meeting Dr. Brower and interviewing him for my film while at the biosphere this month. One of Dr. Brower’s suggestions on how we can help the Monarchs is along the millions of miles of roadsides in the eastern United States, if we cold get highway departments to plant for pollinators rather than cutting everything down and spraying herbicides. This would be of great help to the Monarchs, insects in general, and many species of birds. I’ve thought a great deal about this and it is my foremost reason for creating butterfly and habitat gardens, such as the butterfly gardens at the Gloucester HarborWalk. I think too, of the many patches of unused city-owned land dotted about our community and how we could turn these little patches into habitats for all our winged friends. For several years I have wanted very much to organize this project however, I have my hands full with launching the film. Once the film is complete, my hope and plan is that it will become an inspirational and positive educational tool to help generate interest in community projects such as these. In the meantime, as many of you may be aware, since 2007, I have been creating exhibits and giving lectures about the life story of the Monarch, on the state of butterflies migration, and how we can help the Monarchs both as individuals and collectively. I purposefully do not publish a price on any of my lecture listings because the cost of my programs are rated based on the size of your group or organization. No group is too small and I don’t want budget constraints to prohibit making the information available to all who are interested. Here is a link to my Monarch program. If you and your organization would like to learn more about the Monarch Butterfly and how you can help, please contact me at kimsmithdesigns@hotmail.com. This entry was posted in Monarch Butterfly Film, Monarch Butterfly in Crisis, Monarch Butterfly Migration in crisis and tagged Beauty on the Wing, Dr. Lincoln Brower, Monarch, Monarch Butterflies, Monarch butterfly, Monarch butterfly in crisis, Monarch Butterfly Migration on February 3, 2014 by Kim Smith.